Practice Area: The course has a nice practice area for chipping, putting and a grass tee driving range. Description: This 9-hole public course is only a few minutes from uptown Charlotte and convenient to I-77. 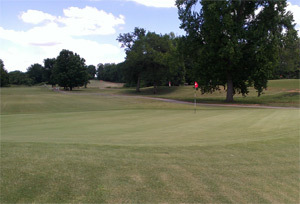 It was originally built in the 1930's as Charlotte's first municipal golf course but was renovated in the summer of 2010. It now sports bermuda greens and a nice pro shop. It also bears the name of Dr. Charles Sifford, the first African American to earn his PGA Tour playing card. Notes: The course is managed by Ratcliffe Golf Services and is also home to the First Tee of Charlotte, which promotes core life values and introduces young people from all walks of life to the great game of golf. B-Man's Take: Similar to all the Ratcliffe owned courses, it offers some of the best, most affordable deals for playing golf in town. It also caters to beginners and prides itself on great customer service. Since the renovation in 2010, the course has been kept in consistently good shape. The inner cluster of holes (2-5) are all side by side -- which gives you a chance even with wayward shots. There are some woods and hazards in play on a few holes. Several of the doglegs can make the course short for long hitters who can cut corners. The greens can be challenging - the small ones are difficult to hit and the large ones have tricky slopes and tiers. The 9th hole is the only par 5 and danger lurks off the tee with woods and a creek in play, then an uphill approach to a perched green where errant shots will bounce out of play. My favorite hole is the short par 4 5th hole -- if you can carry the tall trees on the right side with a high trajectory driver or 3-wood, you can reach it for an eagle try. With a location near uptown and only 9 holes encouraging beginners and newer golfers to play, the course can get crowded on weekday afternoons and evenings.